Buteless® High Strength (this is not Phenylbutazone) is a natural and palatable formulation containing botanical extracts, providing a powerful natural alternative that can be used in the short or long term without concerns of side effects. A safe and natural alternative to Devil's Claw for joint comfort. An effective support for tired and stiff joints with no known side effects. If it is Glucosamine you want, this won’t disappoint! Now 12,000 milligrams per serving and fortified with MSM & HA, to support your horses joint health. A great value quality product lasting 60 days for a maintenance supply. Hyaluronic Acid is a major component of synovial (joint) fluid essential for smooth working of the joints. 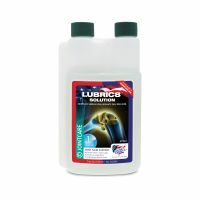 Lubric8 contains a low molecular weight Hyaluronic Acid for maximum absorption, providing extra lubrication when needed. MSM (methyl sulphonyl methane) is a high quality, bio-available form of organic Sulphur, which is an essential component of connective tissue, cartilage, skin, and hooves. Sulphur is believed to have many benefits to the body as it has the ability to pass through cellular tissue with ease.